As is clearly evident by a quick scan through our the preceding entries in our 50 Greatest Football Shirts Ever series, adidas were enjoying a golden era during the 1980s and seemingly could do no wrong. 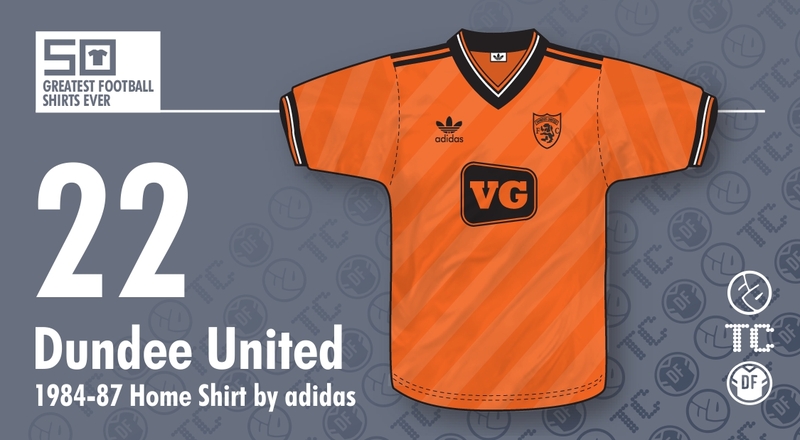 This rich vein of kit design form continued north of the border with their 1985-87 kits for Dundee United that are splendid examples of the quality of their strips during this period. 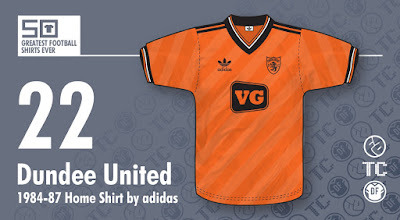 Adidas had been residents in the kit room at Tannadice since 1977 and this, their third home kit for the Arabs is arguably their best with so much to admire within it. Much to the excitement of kit nerds at the time (well, me anyway) the shirt featured dynamic DIAGONAL shadow stripes - a new development in this most stylishly subtle way to decorate a shirt. The trend for including a third hue to kit trim in the mid-80s suited the club’s tangerine and black colour scheme a treat with the newly introduced white adding a whole new level of sophistication to the ensemble. The shirt is also notable for the inclusion of the rather smart and angular logo of supermarket/convenience store chain VG, the side’s first ever sponsor. VG's parent company included future United chairman Eddie Thompson as part of their managerial board and it was Thompson himself who engineered the deal with the club. Interestingly the VG logo on replica jerseys was much smaller than the ones on the players’ versions. Adidas obsessives will note the truncated three-stripe trim (yes, this was back in the days when adidas did something different for a change with their most famous branding adornment!) that stopped neatly at the shoulder in a similar style to that also sported by Liverpool at the time. The epaulette-like rendering of the three stripes seemed to give the shirt extra gravitas and strength which suited perfectly a very impressive Dundee United side who, at the time, were enjoying their own golden era and rampaging through Europe in the UEFA Cup whilst wearing this kit. In fact this strip’s last outing was against Gothenberg in the second leg of the 1987 UEFA Cup Final where sadly a 1-1 draw was not enough to avoid an aggregate defeat to the Swedish side (although to give credit where credit’s due, United had already knocked out Barcelona earlier in the tournament). For me, this kit is another superb example of a great outfit accompanying (and possibly inspiring?) a great team - and you must remember that in the mid-80s Jim McLean’s side were pushing the Old Firm all the way for domestic honours... which was given extra spice by the notion of the logo of a pretty small Scottish convenience store appearing in some of the biggest stadiums in Europe!